Medieval 2: Total War boasts an impressive array of new graphical and gameplay enhancements, including the capability for a massive 10,000 dynamic characters to be taken into battle at any one time. On top of this, The Creative Assembly have implemented a fully redesigned multiplayer mode that offers a dynamic multi-battle campaign bolstered by an unprecedented level of visceral combat choreography that reflects the brutality of medieval warfare. Set in the most turbulent and bloody era in European history, Medieval 2: Total War allows gamers to lead their armies across the battlefields of Europe and the Holy Land before discovering the and doing battle with the fearsome Aztecs. 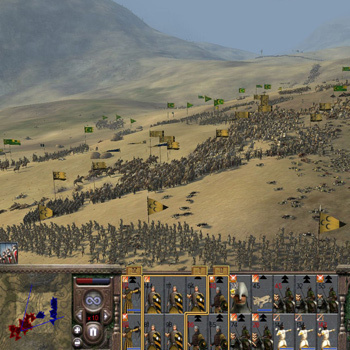 Medieval 2: Total War offers a vastly enhanced terrain model to create new graphically rich environments portraying breathtaking cliff top castles and enhanced settlement features that are unique to each civilisation.